How do you hold a guitar pick? This is a common question, and some guitarists might claim there are many ways to do this. However, there is one great way to hold a guitar pick that will give you an even sound on up picks and down picks, produce a fantastic tone, and is physically comfortable and efficient. If we just study a little bit about how sound is produced on the guitar and how the body works, we’ll see some great results. This is one of the first and most important things I teach to my students in their guitar lessons. At they end, they always sound better with lesss effort. And that makes me happy. Please watch the following video to see the answer, as the video demonstration will be easier to follow than the steps here in this post. However, if you would prefer to do a step by step approach, I’ve got the steps written for you below. Or, for the fullest experience, do both! In order to use the guitar pick properly, we should know how the guitar best produces sound, how to hold the pick against the string to get that best sound, and how to use the body most efficiently to get that movement. How does the guitar produce sound? This explanation is rather simplified because there are many ways in which the guitar soundboard and strings vibrate. However, all you need to know for this discussion is this: For the guitar to make sound, which is simply vibrations in the air, the guitar top has to move in and out to displace or move air. The movement of the guitar top toward the guitar back and out is the most effective way to move a lot of air. It certainly wouldn’t move a lot of air if the it vibrated up and down, from the sky to the floor. See the diagram. So, in order to move more air, we need the guitar top to move in and out. In order for the guitar top to vibrate this way, something has to move it that way. Thus, the strings must move in and out to get the guitar top to move in and out. It is for this reason that the rest stroke on the classical guitar sounds fuller and more powerful than the free stroke, because it presses the guitar strings into the guitar, not toward the floor. So, the best way to hold the pick on the string is in such a way that causes the strings to vibrate in and out of the guitar. So let’s hold the guitar pick on the strings in such a way. 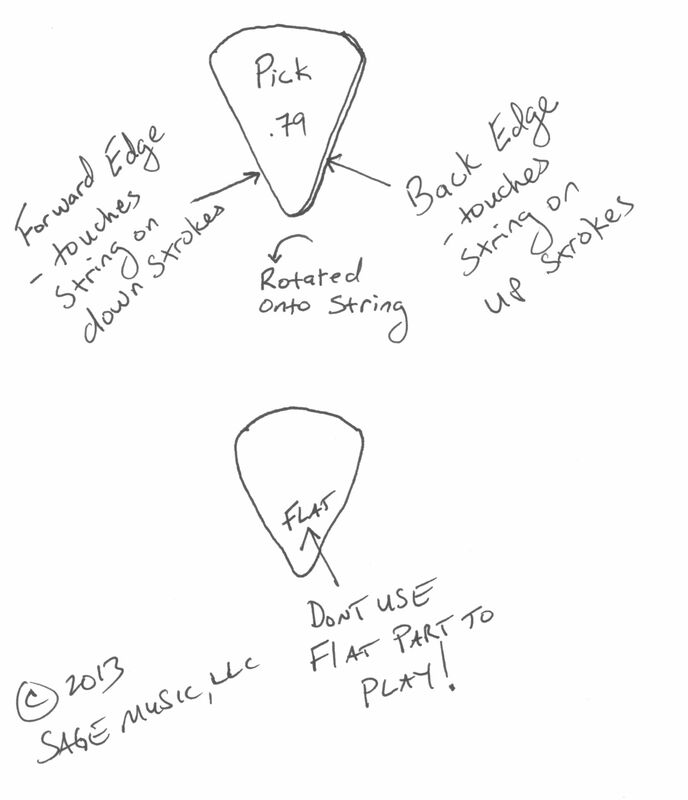 Instead of placing the pick flat onto the strings, rotate it so that the pick’s edge is on the string. See the diagram. When in this position, instead of pulling the string toward the floor, the pick’s edge creates a ramp which pushes the string into the guitar when playing. This causes the strings to vibrate more in and out, producing that fuller richer sound. See the diagram. Lastly, be careful not to let the pick lean toward the ceiling or floor. It should be pointing into the guitar, perpendicular to the top, and rotated to be on the forward edge. If it leans up or down, that will change the angle of attack to the string, making your up and down strokes sound different, and feel different. Now that you know how to place the guitar pick onto the string, here is how to hold it. Make a loose fist in your picking hand. Notice that your thumb and index finger are touching. Place the pick into that place between the index finger and thumb, ensuring the pick is pointing directly into the guitar. That’s it! When you hold the pick this way, the hand is very relaxed. Better yet, when you place the pick onto the string, while keeping the wrists aligned, move up and down from the elbow. This will naturally and automatically put the pick onto the forward edge, producing the fullest sound possible. In case you drop your pick into the guitar, see here. Hi Chris, Thanks for the note! I'll add a video or new post explaining these things for you. But a short answer for now...yes, the wrist is involved in picking, but the the majority of the movement and power comes from the elbow. Think of it like swinging a baseball bat. You don't move the wrists, then then elbows, then the shoulders, then the hips. It works the other way. The hips lead, then the shoulders, elbows, and wrists follow. On the guitar, the elbow leads and the wrist follows. But the movement of the wrist is really minimal. More wrist movement actually leads to more scraping sound. Also, there can be a scraping sound on the low strings if the pick direction is not correct. In other words, you can get a better sound with the angled pick, and avoid the scraping sound by using the correct angle and the correct direction. Your friend is correct that using a pick flat on the string will decrease the scraping sound. But you lose tone quality by doing that. Ideally you want to limit the scrape and to improve the tone. The pick flat on the string only does one of those things, not both. That helps a great deal, Sage... thank you for your thoughtful reply. I look forward to the video! I've been wondering why I can fingerpick great classically, but I could seem to completely eliminate tension when holding a pic. I was doing everything you say in this article EXCEPT, I've been using almost only wrist; I've never moved my forearm to engage the picking. Instantly could feel my wrist finally relaxing. Great! We are glad it helped! !